GitHub - PaulKinlan/QuickLogcat: Runs Android Quicklog from the web. Runs Android Quicklog from the web. Want to be notified of new releases in PaulKinlan/QuickLogcat? 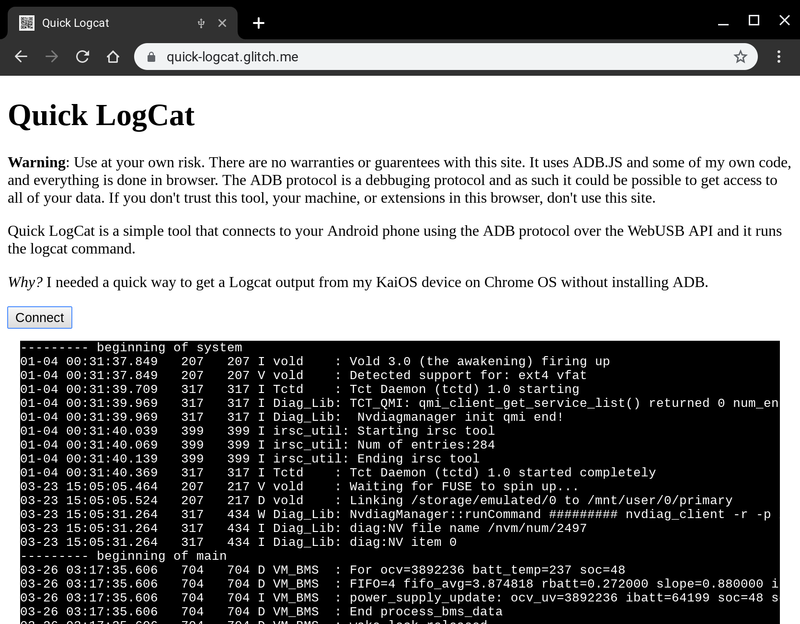 A simple tool that will connect to your Android Device and run logcat. This is useful for debugging Android devices from a browser such as Chrome OS, or if you don't want to debug any Android device without having to install ADB. Warning: Use at your own risk. There are no warranties or guarentees with this site. It uses ADB.JS and some of my own code, and everything is done in browser. The ADB protocol is a debbuging protocol and as such it could be possible to get access to all of your data. If you don't trust this tool, your machine, or extensions in this browser, don't use this site. This site uses the awesome webadb.js.